Holiday periods are the busiest time of year for gift card vendors, with consumers opting for simple, convenient and low-risk gifts that recipients will enjoy. Not only does the retailer have the “money in the bank” at the moment of transaction, statistically two out of three gift card sales will lead to purchases exceeding the value of the gift card. 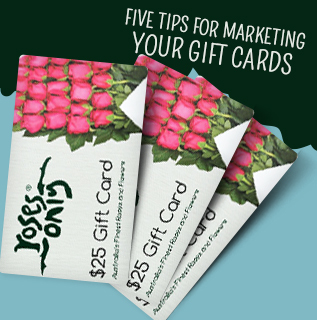 Here are five simple ways you can incorporate gift cards in to your marketing strategy. How many times have you seen those really basic, boring, dare I say it – ugly – cards that just don’t inspire you? Gift cards aren’t just a way for someone to pay, they’re an extension of your brand. A genuine marketing opportunity! Here at PR we’ve done millions upon millions of gift cards for countless customers, and we always have the best feedback when our customers do cool designs that really stand out. If you don’t have a designer, don’t worry. Drop us a line – we can do it for you. This almost goes without saying, but you’d be surprised how many people can miss the basics. Make sure your gift cards (or prompts informing people that gift cards are available) are everywhere: on your counters, on your website. on your price lists, on any sales-specific signage. For example, a lot of people miss letting their customers know that gift cards are available on their price list. Think about it: Jack is looking to buy something from you, and on your price list discovers a product that Jill would like. He then sees that gift cards are available, and decides to buy one for Jill as her birthday is coming up soon. Purchasing interest, opportunity and intent covered in just a few seconds. Use your gift cards to encourage your loyal customers to spend. For example, a free $10 gift card if they spend $100, or a free $20 gift card if they spend $200. Not only do you reward your best customers, remember what we said earlier about 2/3 gift card sales exceeding the value of the gift cards? This is where that statistic can be very powerful. Find other businesses who you don’t compete with, but operate in a similar market. For example, let’s say you own a dog washing business. You can align with a local pet food store, a local pet supplies store, the local vet and many other businesses. Do free “contra” deals with them, you pass on their promo gift cards to your customers, and they do the same for you. You all have people with similar interests, exploiting that connection for common interest is a great way to increase your customer base. If you’re worried about “giving money away” and don’t want a loss leader, simply set rules on the promo gift card (i.e. $50 gift card only valid on purchases of $100 or more) to ensure that you receive some value from the opportunity. People LOVE convenience. Seriously. The digital age has made us lazier than ever, and sometimes – especially over holidays when there are a lot of different things competing your limited attention spans – sometimes people just want the decisions made for them. Or, at the least, a cool email letting them know what their options are. Pop out a quick email letting your customers know that gift cards are now available. Show off those awesome designs we talked about earlier. Hit your social channels up and possibly consider advertising on social during busy periods. Offer referral gift cards for customers that bring in new business. The key to gift card success is putting them in people’s faces, whether it be at your point of sale in retail, on your website, on email or on social media. PR.COM.AU has everything you need if you’re ready to start offering gift cards to your customers. You can send us a quick message or give us a call today at 1800 801 901.